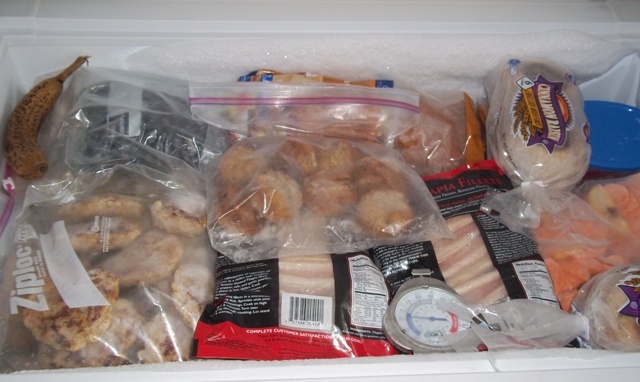 As you can see, my freezer is stocked to the gills with veggies, freezer meals, meats and fish, etc. It is time for another pantry challenge. This time, my pantry challenge will run from January 1st to February 15th. I am giving myself a fairly generous limit of $50 a week for groceries. (Usually I spend $70 to $100 a week on groceries, when I used to include diapers in the mix. I am not including diapers this time.) I realize that $50 a week is high for a pantry challenge, but we are in the midst of testing my daughter for a dairy intolerance, and it looks like that might be her problem. If that is the case, I will need to buy almond or soy milk not just for myself but also for her. In addition, she loves dairy (just like I used to!) and routinely ate yogurt, cottage cheese, cheese, etc. There will probably be a learning curve as I learn what she can eat to still get the proper nutrition. (Have I told you how fussy my daughter is? Dairy was one of the few food groups she ate without complaining.) So, I am setting the limit at $50 a week to buy milk, almond milk, fruits, veggies, bread, etc. I am hoping I will not spend that much weekly. Having just completed a couple of big grocery trips, I am going to do the same. We could live on what I have here, with the exception of milk, eggs and fresh produce, for quite a while. I am feeding a family of 6 (7 if oldest dd is home from college). Milk alone costs us around $15 a week. So, I think $50 will be plenty also. I need to be better at planning meals, so that’s where my goal is beginning. I hope to have a week or 2 planned today. Kelly–How much do you typically spend on groceries? My 6 year old is hungry all the time, so I can only imagine how much all three will be eating when they get a little bigger. I would love to join you. I’d like to know how you just spend $50 a week though. We set a budget of $80 per week and there is only 2 of us. Please teach me LOL. We have largely lowered our grocery budget by only buying meat that is $1.99 or less per pound (I love the meat that is 50% off because it is close to the expiration date! ), avoiding most processed foods and trying to only buy fruits we can get for 1.00 a pound or less. Freezer cooking also helps. I have no idea how I am going to do this, but I’m going to try. I need more time to formulate a plan. The end of the month is always a pantry challenge for me. My grocery budget is pretty set, as my family is on food stamps. I know it is supposed to only supplement, but I am trying very hard not to use more than that for groceries. This may be just the push I need to make that happen. Keep us posted as you develop your plan. Glad to have you onboard! I am so excited about this challenge. Today is my last day at my job. I quit so that I can stay home with my kids and therefore we need to be more conscious of our spending. So, this is the perfect challenge for me. I starting following your blog about a month ago and have already learned so much. Can’t wait to learn more. Thanks for all the tips. Don’t know how much my $$$ limit will be yet, but I will take a look this afternoon. Nicole–Congratulations! It must be scary to give up your paycheck, but it will be wonderful to stay home. I am hoping to quit my job after my leave of absence ends. This is a trial run for us as today I will get my last paycheck. After that, we will be living off my husband’s limited income and the money I can bring in, which is part of the reason for the pantry challenge! I’ve been doing the same thing these past couple of weeks. My freezer was just getting too full! So I’ve been “cooking from the pantry”. We’re still eating good though! My son also can’t drink milk so he & I have been on a dairy free diet for about 8 months. He’s only 14mths old & it’s been hard finding toddler snacks for him that are dairy free but we’re making do. Good luck to you! If you have found any recipes your son really likes, I would love to hear them. My daughter is not big on protein; she got most of hers from dairy, so we are struggling with that aspect. I only spend about $20 a week on groceries for the two of us, but we are both vegan. Do the non-vegan things really make that big of a difference? Do you eat all your meals from home? If so, do you post your menu plans online? I would love to further try to lower my grocery bill, and it sounds like you could enlighten me a bit more! I so wish I could join you but my pantry and freezer/fridge is almost bare. Maybe I’ll do an initial stock up then join?! Ive commited to participating in Penny Saver’s challenge for 2011 and hope to save $11, 000. What better way to kick off the year than with a pantry challenge? Im formulating a post at the moment about my parameters for my grocery spending (probably $75/week including other household items) for the coming months and so this comes at a perfect time. I am joining Penny Saver’s challenge too, though mine is not to save money but instead to not dip into our savings while we are earning our low income this year. Feel free to leave a comment linking to your pantry post when you get it done. Good luck to you on your pantry challenge. I am sure you will be able to accomplish this! I am definitely in on this. Dear Hubby and I were talking about this last week. We are using the month of January as a pantry challenge to save a little money and to use up what we have. Our freezers are full, the cabinets are full. We have 4 of us–myself, hubby, daughter Rebecca (4), and son Jacob (15 months). I am setting our weekly grocery alotment at $20 so that all we buy is milk ($10), bread, and fruits and veggies. I am also setting aside $20 to buy diapers this month and $20 for household items, so my total for spending this month is going to be $120 or less. I hope it is less! I hope to post our plan soon on my own blog…. Good luck. Feel free to comment back with the link when you have your post up. I have a son who is allergic to milk protein (casein & whey) and soy so I understand. It is hard because it is in most everything. Do you have a Trader Joe’s? I buy my son’s rice milk there. It is $2.79-2.99 for a half gallon carton (which can be stored on a shelf – like Rice Dream – until it is opened). Also, Almond milk has been $2.99 at Kroger, which is my son’s new favorite drink. Good luck on your challenge. I am doing it 2 weeks at a time. I can’t go very long w/o grocery shopping. We do have a Trader Joe’s, but I haven’t gone. I will have to try it. We love Almond milk! for the dairy intolerant So Delicious Coconut yogurt is great. It has all the bacteria of regular yogurt and the good fats of the coconut. It is rather expensive $1.99 for 6 oz, but it is well worth it! We have moved to Minnesota and living in a tiny apartment. I no longer can stock up to much so no pantry challenge. My extra cans are stacked on counter near microwave. We are moving next year late summer to a larger apartment where I will have cupboards. What is the link for this Penny saver challenge. would like to look in that. I’m in. I have actually set myself a goal of spend only $50 a month for the next three months. It should be doable, especially with the amount of stuff I have frozen, canned, and in the pantry. Wow, $150 only spent in three months would be great! After the craziness of the holidays I am feeling a really strong need to simplify, downsize and take control of the finances more. We have so much excess in the freezer and pantry that I can probably go for weeks without grocery shopping. I am making it a goal to keep our grocery bill to $50 a week and to use up as much of my freezer stock as possible this month. I am doing a pantry challenge as well. I am only buying dairy, bread and fresh fruits and vegetables during the month of January. I also have challenged myself to make the most of leftovers. I have a bad habit of forgetting about them and finding them weeks later…. I have that same bad habit with some leftovers. That is definitely a trend I hope to improve upon with this pantry challenge. Yay for the pantry challenge. I am also doing the Pantry Challenge this month. Am I cheating cause my budget is $60 (or less) for the week? My two daughters (12 & 10) are going through growth spurt and eating me out of house and home! I’ll check back with you later in the week to see how you are doing! Come by later this week and see if I manage to stay under the $60 limit. I don’t think it is cheating at all, especially if you manage to lower your grocery bill for the month. Good luck! I too recently went from teaching full time to staying home so also trying to find creative ways to not spend so much and it seems like groceries is the one area we spend too much on and don’t need too!!! I plan to post my weekly meal plan and show how I’m using the pantry vs. grocery shopping!! We’ll see how it goes! The cleaned up pantry looks great! Feel free to link back here when I update the pantry challenge (either on Friday or Monday). Good luck with your challenge! I just came across the Pantry Challenge today. I think I was told once that you can make your own almond milk..though I’m not sure if the labour involved is worth the money saved..I look forward to following your blog posts! I read that about almond milk too. It would be worth looking into. I’ll have to put that on my list of things to do. i want to jump on board for the pantry challenge, so how does it work? Great. You try to mainly feed your family with items you already have stocked up in the pantry, freezer, etc. Then, you set how long you want the challenge to run and how much you will spend weekly. For instance, I began my pantry challenge 1/1/11 and it will end on 2/15/11. I aim to spend no more than $50 a week on groceries during that time for my family of 5. If I am able to do it, I will save myself $30 to $50 a week! (I usually spend $80 to $100 a week.) If you want, feel free to blog about your pantry challenge and link up in the comments.